In this supersaturated informational environment that we live in, crafting intriguing, relevant and valuable information is your number one goal to target your audience. How Do You Become a Good Content Creator? It all starts with what you do before you put your fingers to the keyboard. Let’s ask some questions that will help put you on the path to discovering the kind of content that you need to be producing to capture the attention of your desired audience. 1. Do you read industry-related news? If you don’t already, now is the time to start. This can be a great resource for you to learn about innovative technology coming to your industry, recalls on parts and/or vehicles, and much more. Finding industry related forums is also another key to becoming a contributor to your industry. 2. Are you curating content? Nowadays, there are plenty of people curating (collecting) content. Anyone who can write and has access to the internet can take someone else’s content and share it on Facebook, retweet it on Twitter and pin it on Pinterest. But truthfully, the most successful content creator will be someone who can position themselves as an expert fueled with genuine interest to the community and audience you are sharing to. 3. How knowledgeable are you? By now, if you’ve started reading industry related information and following and commenting in forums, you’ll have built up a knowledge base which you can reflect on. People that are drawn to your business will want to know useful information or even a thought or opinion when you’re sharing content. We suggest that you save your curated content (you can save the links to the articles you read on Trello.com [hyperlink] or make a folder in your web browser for bookmarked pages). 4. Questions make you smarter: Being curious is the first step to identifying something worth solving or discussing. Whether it is an issue you want to solve or an educated opinion you want to share, bringing the attention to your blog and/or website because of your industry related curiosity, is the key to the ignition of content creation and audience engagement with your brand. 5. Define your audience: Even if you think anyone can benefit from your content, it’s better to focus your reach on a particular audience or niche subject matter related to your business. Once you hone in on your desired audience, you will find you’re reaching the kinds of people you can convert into customers or retain their future business with their customer loyalty. Keep in mind, creating content isn’t just about writing something every day. Rather, it's about becoming an active member of a community - one that pokes, prods, writes, reads, talks, and asks questions. There's no magical method for becoming a great content creator. You just have to become an engaged and thoughtful participant in the communities you write, read, and work in. Content is a vehicle to get your business to where it needs to be in this digitally driven world. Once you get in the habit of producing and sharing industry related content, you’ll begin to see some return on your invested time with customer loyalty, brand awareness and being able to engage your target audience. If you’re already producing content for your business on a consistent basis, please share with us in the comments for people who want to learn from your example and hone in their content creation skills! What Does Curated Content Look Like? Content marketing is your opportunity to supply valuable information to make a customer’s journey to purchasing and business loyalty that much easier and natural. The best method of sharing curated content is not just a simple post, but a reflective and thought-driven experience. 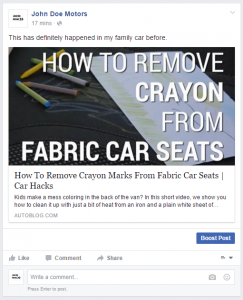 For example, sharing an informative video with step-by-step directions on how to remove crayon from the fabric of a vehicle. Below we have created an “okay, good, better and best” posting for this content via Facebook. Okay - Sharing an interesting post. 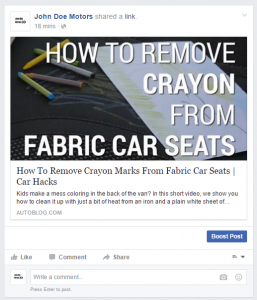 Pro Tip: You found an interesting article to post but you may want to think about sharing a thought along with it, too! experienced having crayon in your car experienced having crayon in your car. Pro Tip: Perhaps try asking a question to engage your audience! Better - This is a direct approach and facilities the opportunity for your audience to have a conversation with you and other people on the comment section. Best - Pro Tip: We choose this one as the best example because it represents all of the recommendations from above. 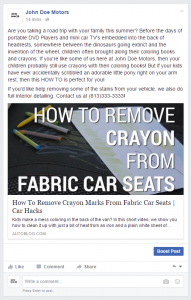 It is relatable, it is informative, it is witty and funny, and you’ve also included a Call to Action (getting your customers to take action by 1) cleaning the crayon off of their car, or at least attempting it on their own, and 2) if they are unable to do it on their own, they’ll probably give you a call to set up an appointment).